Guwahati, November 24 (IBNS) : A male rhino calf, that was injured by a tiger, was treated on Monday morning by the International Fund for Animal Welfare-Wildlife Trust of India (IFAW-WTI)-run Centre for Wildlife Rehabilitation and Conservation ( CWRC) MVS team. The calf, aged approximately three months old, was found on Monday near Japori Gaon, a fringe village near the Agoratoli Range of Kaziranga National Park. The calf had several tiger attack injury marks and was found lying in the backyard of a house adjacent to a paddy field. The Kaziranga Forest Authority, part of the Assam Forest Department, was notified, and they sent an emergency call to the CWRC-MVS team of IFAW-WTI, led by veterinarian Dr. Panjit Basumatary. 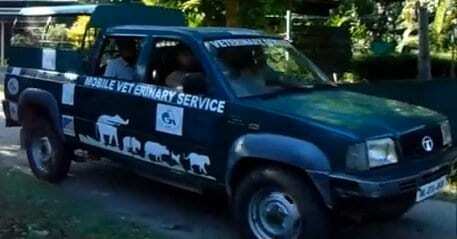 When Dr. Basumatary’s team arrived, they saw the animal limping and unable to move properly. They physically restrained the calf, provided first aid treatment and then brought it to CWRC for further investigation and intensive care. “The calf has several injuries, out of which a few are deep maggoted wounds on top of the head and hock joint. As the calf is still limping, we need to take it for an X-Ray, before we decide on the specific line of treatment,” Dr. Basumatary said. The calf being monitored by CWRC caretakers initially showed signs of aggression. “We have handled eight cases of rhino calves displaced due to predation-injury in the past, and in most such instances the mother is not around, necessitating our intervention,” Dr Ashraf, Chief WTI Veterinarian said. CWRC has previously attended 32 cases of displaced rhino calves. Recently, three orphaned rhino calves that were hand-raised at the centre were radio collared and released into the Manas National Park. Two weeks ago, a team was dispatched to rescue a young elephant that had become trapped upside down in an irrigation ditch in Borhola. Last month, a rescue team was sent to provide emergency relief to animals affected by super cyclone Phailin, that saw extensive human evacuations.